Bars belong in a very competitive market. Therefore, marketing and promotional activities are necessary in order to differentiate themselves from the competition and to attract new and repeat customers to ensure profitability. Hosting events is a great way to do this. However, not all types of bar events will work for all kinds of bars. One must determine first which ones will best fit the location and target niches of the bar. Below are some ideas for Sydney bar events. The Australian Bureau of Statistics states that the average number of people in the top 10 singles suburbs in Sydney are significantly higher than the state average. Take advantage of this by hosting a Singles’ Night one night a week. Take it a notch higher by hosting a speed dating event. There are times when even singles prefer to go on a night out only with friends of the same gender. A Ladies’ or Men’s night will be a great opportunity for you to push certain items on your menu that are only typically ordered by a particular gender, such as certain cocktails for women. Sponsoring local professional or community sports teams is also a great idea. Aside from attracting sports fans, you will also provide these teams a venue to celebrate their wins and hang out during their off days. If you have TV screens in your bar, you can also offer special screenings of games with matching special drinks and menu offerings. This option might require you to move around your bar furniture for a night but it’s a fun way to entice dancing divas to visit you. Aside from playing cool music, you can also hire dance instructors for your guests. Themed dancing events such as a Salsa Night is also a good way to target a more specific niche. Hosting this type of event will not only be a great opportunity for you to lend support to a great charity but will also give you a good reputation as an upstanding establishment in your community. You can either sponsor your venue for the event or donate a portion of your earnings that night to the charity. Having guest bartenders is one of the best ways to direct focus on the most important aspect of your establishment – the bar area. Whether you decide to hire a professional bartender, a celebrity or a regular customer, it is guaranteed to attract a crowd of their fans, friends, and family. Another fun alternative is to host a bartending competition instead. If you’re already hosting a dancing event, why not try a karaoke night as well to draw in guests who are up for a fun night of singing? Don’t have the necessary equipment. Just rent one if you don’t want to make an investment. This is one of the easiest events to host. Just invite a comedian or two and provide them with a stage area, a microphone and a bar stool and you’re up for a night full of laughter. 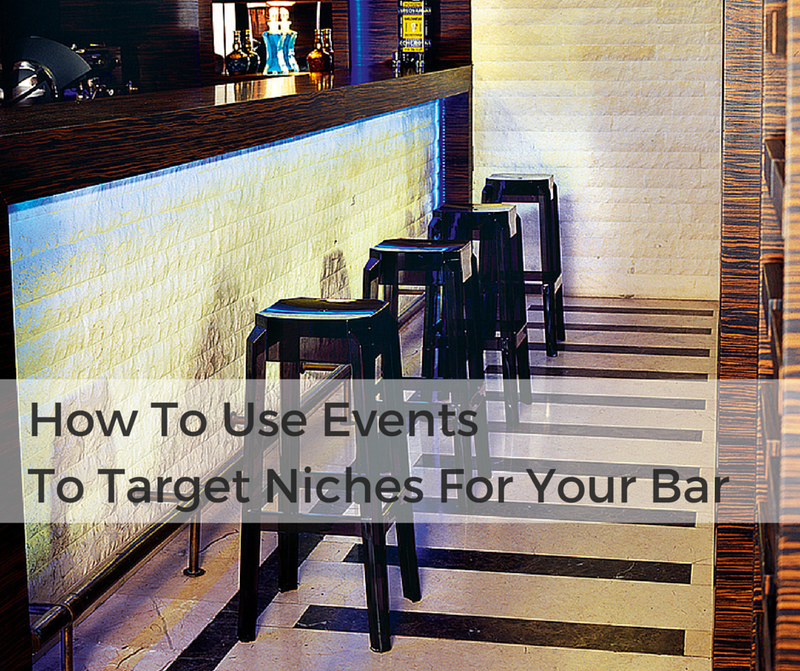 There are many types of events that cater to a variety of niches. They key is to study your market to figure out which ones will work for your bar. No matter what event you host in your bar, Nextrend has the bar furniture that will ensure your customers’ comfort and enjoyment. Check out our selection of bar furniture in time for your next event.